The New Boho Handbook guides readers in beautifully simple techniques for adding good vibes, and style to living spaces. Packed with hundreds of ideas for bringing positive energy to your home, the book features exercises and activities for thinking about rooms in new ways. With Justina's expert guidance, learn how to rearrange, paint, prop, and plant your way to a home that's fresh and inspiring. Uncover your "spirit environment" and learn how to use colour and scent to enhance mood, productivity, and relaxation. Revel in Justina's encouraging advice, ("you got this!") and easily and affordably turn any dwelling into a personal sanctuary. "One early adopter [of Instagram] was Los Angeles-based designer and artist Justina Blakeney. 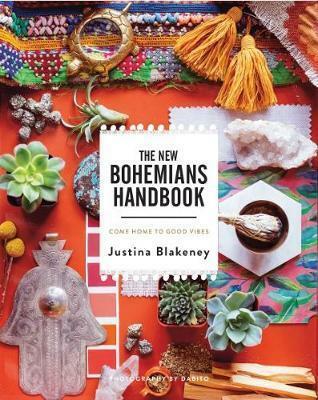 She has a blog and online design shop called Jungalow and is author of The New Bohemians Handbook: Come Home to Good Vibes (Abrams, GBP19.99). Her handle, @thejungalow, now has more than 880,000 followers, and the platform is perhaps the perfect showcase for her love of juicy colour and luxuriant botanical motifs. Founder of the award-winning blog TheJungalow.com and author of the New York Times bestselling book The New Bohemians, designer and artist Justina Blakeney is the go-to source for bohemian design inspiration. Her eponymous lifestyle brand, Justina Blakeney Home, includes home furnishings and accessories with: Loloi (rugs), Hygge & West (wallpaper), Selamat (furniture), Jonathan Louis (furniture), Valdese Weavers (fabric), Studio Oh! (paper products), Wedding Paper Divas (paper products), and Peking Handicraft (bedding). Justina lives in Los Angeles in her Jungalow with her husband and daughter.